CONGRATULATIONS Rob on being the very first European Car of the Month! As you are all aware, we missed last month due to me being so busy!(Tranzic). I can't apologise enough but Andy and Hayley were worthy holders of the title as everyone agreed. Well WE'RE BACK! MAHOOSIVE thanks to Steve (Stevie-Boy) for taking on the feature this month and please keep an eye out on the forum for some decisions as regards format for next month etc. Anyway, without further ado it's over to Steve and Rob. Firstly, congratulations on winning Car of the Month for May 2004, how does it feel to have your car recognised in this way!!?? "Thank you very much! I'm very honoured, and surprised to have won the Car of the Month, there are so many nice (nicer) Primeras in the club! It feels good to be recognised in the club, my first car club by the way that I feel very much at home!! I'm still jumping around through happiness!" Let's find out a bit about you before we delve into the car, let's have some personal details such as your full name, age and what you do for a living and also some brief info on your life enjoying the Spanish sunshine! "Well I'm 28 years, full name is Robert Fraile Forsberg. At the moment I work as a chef in a restaurant called Stefans Restaurante. I was working there for 2 years before moving back to Sweden for 1 year and now I'm back again. Just love the work, the people, everything but the town its located in, Torrevieja. It's a mafia town, you don't really go anywhere safe there and I'm always worried about the car as it is parked on the street. My bosses M3 have had the neck supports stolen, the grille, the M3 emblem, the side indicators and so on. That's why I'm so glad not to live there, I live in a town called San Vicente Del Raspeig 74 km from Torrevieja that is a part of Alicante that is a big and very nice city, about 600,000 people live here." Sounds rough Rob, lets hope the P11 stays unharmed! Any plans to remain in the area? "Me and my girlfriend have a flat here but thinking about building a house. We are getting married on the 12th of June btw ;) Going to get married in an old garden in a very nice restaurant, going to be great!! I really prefer Spain to Sweden, don't get me wrong I love Sweden but everything here is more easy (except the administrative stuff, took me 8 months to get an ID card), the roads are better and its more or less free speed on the freeways. And the weather is so good, you feel happier when the sun always shines! 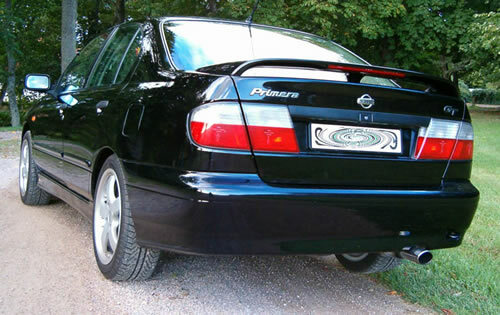 My girlfriend (she is called Laura and is Spanish) wasn't very happy in Sweden where we have about 30min of light every day..."
"Well my father has always had Nissans, Sunnys, Kingcab, Almera and Primeras, and my mother has had 2 Micras now and they have always been happy with them and nothing ever breaks on a Nissan, at least no big things. I remember when my father was looking to buy his first Primera, a 2.0 slx, grey metallic I saw in the brochure the GT version. 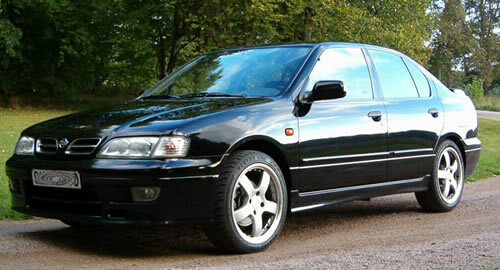 It had 150 HP, ABS brakes, sport seats, alloy wheels, big spoiler and stuff, how cool was that!!! I was begging him to buy that one instead but he didn't...boring! So I was always looking when a GT passed by and was thinking that I will have one of those one day...I was 16 years old at the time :) But my first car was a Fiat Uno Turbo I.E, fast as hell, but not the best put together car if you know what I mean! 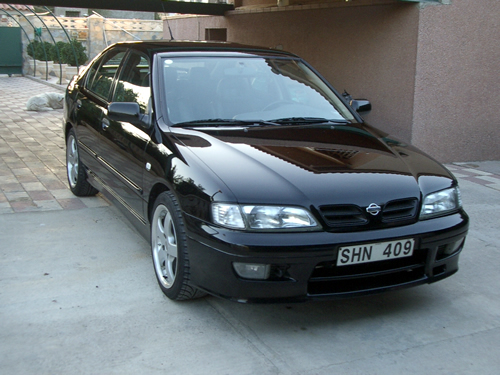 I had that one for 5 years before buying my first Primera GT, a P10 from 1991, grey metallic with 160,000km. Drove that one for 4 years, never had any problem with it, still miss the old one... it had 280,000 km on it when I sold it, still looked like new! After that I bought my recent car! Had it for 1 year soon, love it more every day!" Tell us a little bit about the sort of price paid, mileage when you bought it etc etc. "Well, in Sweden the GT is quite expensive, I paid around £7000 for it. But insurance is much cheaper here, £300 a year fully insured with everything and mods don't cost extra. 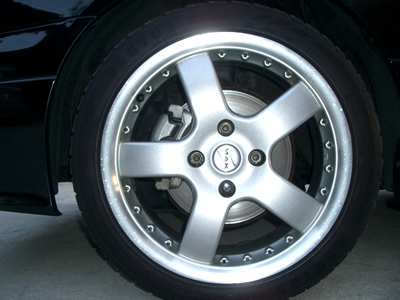 It had the 17" MAK Energy wheels on when I bought it, I'm not so fond of them, but they are ok. I want the O.Z superlieggera III one day... it had about 80,000km on it then, now about 100,000km." A lot of people will notice your car is left hand drive, I assume this is normal where you live and drive, gearshift with your right hand!? "Yes, in Sweden and Spain as well, its left hand drive. 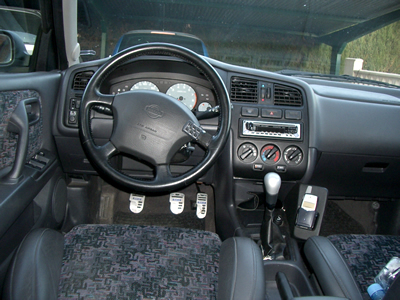 For me it looks very strange to have the steering wheel on the right side. How can you guys shift gear with your left hand? And it must be difficult to go in the drive through in McDonalds, having to lean over to the left side of the car to pay and get your food...;)"
Your car is noticeably clean, is this due to the sunshine or are you frequently to be seen with a bucket and sponge washing it? "I try to keep it clean, a black car that is dirty is not a very nice sight, but a clean one is so beautiful!! I can also say that the sunny weather isn't very good for the car, its dust everywhere, and sticky salty fogs around the ocean at nights and I live 1 km from a cement factory... In the future (soon I hope) I will start a detailing firm, with high class detailing. Doesn't exist here in Spain, they barely know what it is. The Spanish people clean their cars a lot, washing places everywhere, but no detailing. So, I'm still in training so to speak. Detailing cars on my free time for people I know. Will do a full work over on the car soon, polishing, waxing and sealing. 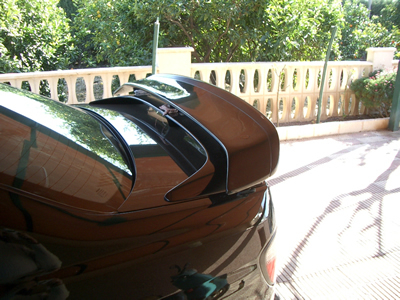 But not until I have the spoiler on, I will spray the bonnet and the front bumper at the same time as the boot and spoiler. They are full of marks." Best of luck with the new venture, could you give us a run down of the mods you have done and any complications you found along the way, your grills look very nice, much hassle to do? 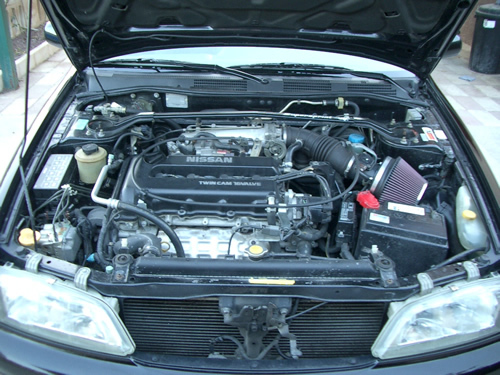 "I haven't done so much yet with the car, so far it's only the grill painting, K&N 57i kit and the Supersprint backbox (thanks for pushing me to buy that one Shaun :) and the Kenwood MP3 player. The grill wasn't very hard, but I was nervous that I wouldn't get it right. The most difficult part is to take it apart, well not difficult but the clips are quite fragile. And there are eight of them on each one. Then I just sanded the chrome down and sprayed some bottom paint, the black paint and then some clear. Glued some mesh on the back with a glue gun. Worked out nicely if I can say so. Still want the UK GT grill though...if anybody has a pair lying around send me a PM! ;) Thinking about making another design on the grill, will let you all know if I do it! I was going to put on the Supersprint myself, got all the tools, rented a garage with a lift. Drove the car in, elevated it, sprayed some WD-40 on the bolts and got started on the first bolt. Broke it, took the car down and went home.... Called a garage to book a time to put it on! And Shaun warned me that the bolts could be stuck... 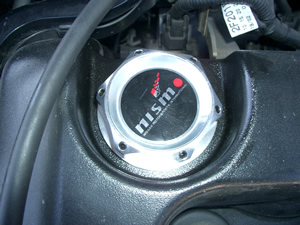 The K&N was easy compare, I just dropped one bolt under the car, down the drain... Had to make another one that fitted with a Dremel tool. But then it was on!!! Nice sound!! " 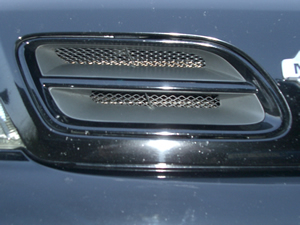 What is your favourite mod that you have done to your car? 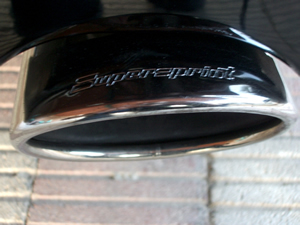 I have to say the Supersprint backbox, looks the bomb and sounds like one :) It really looks like it's a standard part. I was driving my friends M3 (nice car) and he drove mine. I had the windows down so I could hear my car...mmmm...nice! I couldn't hear the M3 sound when my car was close, he wants one for the BMW as well now!" What are your future plans with the GT, anything you can let out of the bag for us? "I will put in a Skyline engine of course :) I dream about doing more stuff than I can afford like all of us! 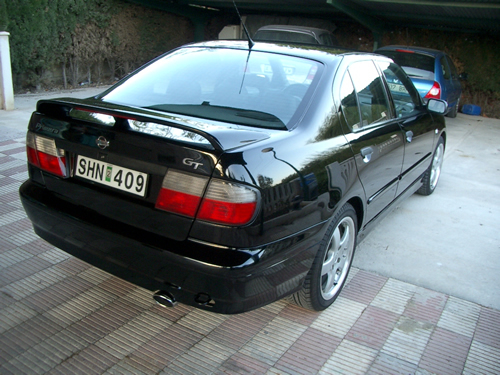 The first thing now is painting the Cosworth spoiler, boot, bonnet and front bumper. 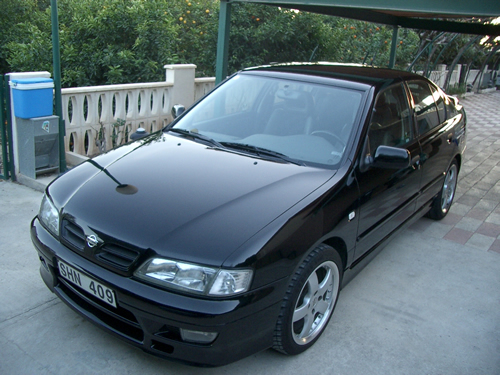 I have also tried to get a hold of a Seat Cupra front spoiler, but it's hard for me to explain that in Spanish. I will have to get my girlfriend to do it..."
"If I get it soon, I will have that one sprayed as well. I have planned this for some time now, that's why I didn't start crying when some friendly soul dented my boot the other day... and an H&R lowering kit is on the way soon. Other than that, maybe a header if I can afford it (weddings are very expensive in Spain). Don't know if I will go for the Martelius one or wait for the price on the HS Gen6 one. If the HS will be as good as they say...and not too expensive I will get that one. Otherwise I will go for the Martelius. And some new good speakers will probably find the way in to the car. Just in to the standard places. So the car will have a Cossie spoiler, Seat splitter, lowered and a really polished deep black paint! 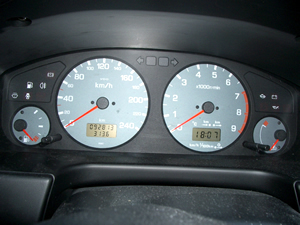 And hopefully go even faster :) That is the plans for my car! But as you all know, plans change... and I have one thing or 2 other things that maybe will happen. Will let you know!" We will all watch this space I'm sure for those mods coming into action! Rob, thanks so much for the interview, you've given us a great insight into your life, your car and your future plans, the floor is yours to make any speeches or thank you's that you wish to make? "I would like to thank everybody in the best car club ever! You guys and girls are the best! So much help with everything, especially inspiration, can't thank you enough!!"